Chinese Vice-Premier Li Keqiang said in Beijing Thursday that China and the United States enjoyed great potential on clean energy cooperation. Li said China and the United States shared increasing common interests on tackling with climate change and pushing forward sustainable development, though the two countries had different domestic conditions and were in different development stages. 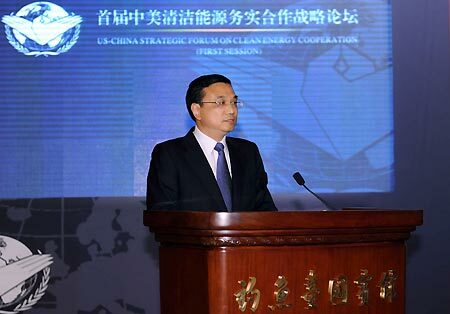 Li made the remarks when addressing the Strategic Forum for US-China Clean Energy Cooperation, which gathered more than 300 guests including former US Vice-President Al Gore, high-ranking officials from both governments and representatives of international organizations. China and the United States are both major energy producers and consumers, said Li, adding the two countries faced great potential on clean energy cooperation. In recent years, China has seen rapid development in new energy and renewable energy, with the adjustment of the international energy structure, said Li. He called for efforts to further the bilateral clean energy cooperation for continuous and substantial progress and sustainable development. He said the two countries should enhance research and application of the technologies of energy-saving, clean coal, coal-bed methane, nuclear power, electric vehicles, encourage the establishment of innovative coalition among industry, academic studies and scientific research, and carry out consultations on energy policy in multiple ways. Noting climate change has become a common challenge for the international community, Li said the countries should, while facing up to the urgency and seriousness of the challenge, seize opportunities, foster new growth areas in the economy, and take the leading position in global competition. He said the international community should actively work together to reduce greenhouse gas emission, conserve energy, and develop clean energy, on the basis of the UN Framework Convention on Climate Change and the Kyoto Protocol, under the principle of "common but differentiated responsibilities" among developed and developing countries, and in line with the Bali Roadmap. During the forum, Li also exchanged views with several US representatives including former US Vice-President Al Gore on promoting sustainable development of energy and coping with the climate change. The forum was co-sponsored by the Chinese think tank China Institute of Strategy and Management and the Brookings Institution of the United States.